That's it for today on Business Live - thanks for reading. We'll be back bright and early at 06:00 on Tuesday. Do join us then for all the latest breaking news and analysis. Wall Street stocks have ended lower, as underwhelming bank earning results weighed down the index, and oil prices fell on signs Russia could boost production. 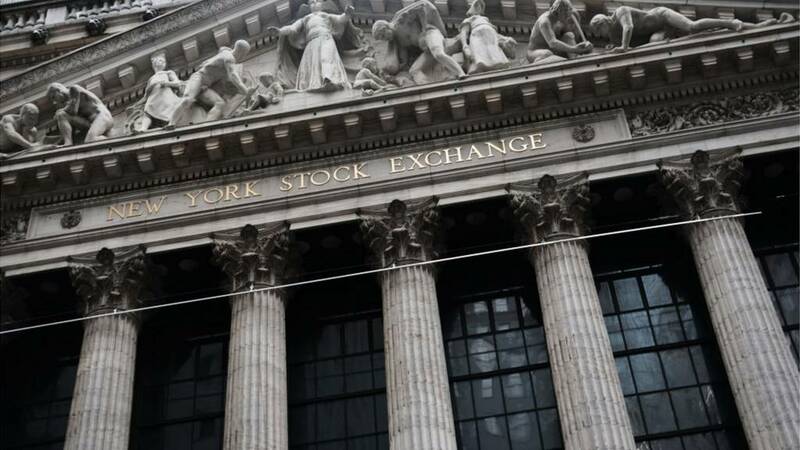 The Dow Jones Industrial Average fell 30.13 points, or 0.11%, to 26,382.17, the S&P 500 lost 1.88 points, or 0.06%, to 2,905.53 and the Nasdaq dropped 8.15 points, or 0.1%, to 7,976.01. Oil prices fell on Monday, after Russia's finance minister Anton Siluanov said Russia and OPEC may decide to boost production to fight the US for market share. "There is a dilemma. What should we do with OPEC: should we lose the market, which is being occupied by the Americans, or quit the deal?" Mr Siluanov told Russian state news agency Tass. Brent crude oil is now down 0.5% to $71.23 a barrel. West Texas Intermediate oil meanwhile has fallen 0.6% to $63.50 a barrel. EY's report into global investment destinations has also found that the UK's merger and acquisitions (M&A) activity since the 2016 EU Referendum has 'remained strong'. In 2018, the country accounted for 10% of M&A globally worth a combined $400bn (£305bn) – its second-best year since the financial crisis. One reason is that foreign investors have been attracted to the weakened pound, which makes British exports and assets cheaper. “Geopolitical issues create significant challenges, but executives are determined to overcome perceived barriers and secure – or expand – their presence in markets that support their long-term strategic goals," Steve Krouskos, a global vice chair at EY, said. “In 2009, boardrooms were paralyzed by uncertainty. Today they are motivated by uncertainty," Mr Krouskos said. The 'Global Capital Confidence Barometer' report surveyed more than 2,900 senior executives from large companies across 47 countries and 14 sectors including financial services and real estate. Britain has overtaken the US as the world's top investment destination, according to a biannual survey by the consultancy and accounting giant EY. The US has held the number one spot since 2014. This is the first time Britain has topped the ranking in the report was launched 10 years ago during the global financial crisis. The results of the report are pretty surprising given the prevailing wisdom is that the geopolitical uncertainty around Brexit - especially if there is no deal - will hurt foreign investment and possibly push the UK into a severe recession. In case you weren't aware, the Notre-Dame cathedral in Paris is currently on fire, and the cathedral's spire and roof have collapsed. It is now believed that the fire could engulf the entirety of the 850-year-old Gothic building. "Everything is burning, nothing will remain from the frame," Notre-Dame spokesman, Andre Finot told French media. The church receives almost 13m visitors each year, more than the Eiffel Tower. It was undergoing major renovations after cracks began to appear in the stone, sparking fears the structure could become unstable. Harley Davidson workers in Milwaukee and Tomahawk, Wisconsin have agreed a new five-year contract with the motorcycle maker that will provide a 14% wage increase until the contract ends. The agreements will provide wage increases to over 1,000 employees in both locations, and they will also receive a signing bonus, pensions enhancements for existing employees, retirement incentives, and two variable incentive plans. Italy's biggest bank UniCredit has agreed to pay $1.3bn to settle probes of violations of US sanctions on countries such as Iran. As part of the agreement, UniCredit's German division will plead guilty in New York of illegally moving hundreds of millions of dollars through banks based in Manhattan on behalf of sanctioned countries. UniCredit Austria has entered into a non-prosecution agreement with the Manhattan District Attorney, and other divisions have also resolved other investigations from several government agencies including the Department of Justice, the Treasury Department, the Board of Governors of the Federal Reserve, and the New York Department of Financial Services. A revamp of the EU's copyright rules has passed its final hurdle and will now come into law. It says that if users upload infringing content to a service, the tech firm involved must either make a "best effort" to get permission from the rights holders or quickly remove it. Last year its growing tea sales were given a boost by some top Yorkshire celebrities - and self-professed fans of the brand - who appeared in its latest advertising campaign. Are you ready for Game of Thrones? US research firm Conference Board is predicting that UK productivity will continue to slow in 2019, and will likely rise by only 0.2% this year. Earlier this month, the Office for National Statistics said that UK productivity rose by only 0.5% in 2018. In comparison, productivity in the decade prior to the 2008 financial crisis had averaged at over 2%. Across central London today you might have noticed several organised protests in Westminster, Waterloo, Oxford Circus, Piccadilly Circus and Marble Arch. Police have advised people travelling into London to allow extra journey time due to blocked roads. The protests have been organised by socio-political movement Extinction Rebellion, which is calling on the government to take action and declare a "climate and ecological emergency". The movement wants the UK to pass legally binding targets to reduce carbon emissions to zero by 2025, and to form a citizen's assembly to decide how to respond to climate change. Climate change protests are also occurring in 80 cities across 33 countries today, and the protesters say they intend to continue protesting for the rest of this week until governments takes action. London shares were mixed on close, as mining and oil stocks fell, offsetting gains from financial stocks. The FTSE 100 ended flat - just 0.2 points lower to 7,436.87. Top of the losers was contract catering firm Compass Group, which slipped 2.4% to £17.49 after Barclays downgraded it from "equal weight" to "overweight" for the first time in a decade. The FTSE 250 closed 95.4 points or 0.5% higher to 19,807.09, led by office group IWG, which jumped 21.5% to 334.8p on the news it is selling its Japanese business for £320m. Could Zuckerberg be ousted from Facebook? Could Mark Zuckerberg be voted out of Facebook? Not a chance according to a report on Forbes. It says a vote is "almost certain to fail because unless Zuckerberg votes for the motion himself, it will fail." The report says that's because of the dual voting structure where the A shoulders hold 82% of the economic interest in the company but only 32% of the voting power. The B shares - which are more than three-quarters held by Zuckerberg - control 68% of the vote. That means he alone controls at least 51% of all votes cast. "The reality is that Mark Zuckerberg has complete control over Facebook, the election of its directors, the makeup of its board, its strategic direction and any major M&A that is entered into," the report says. Jack Ma's backing for the so-called "996 system" is being questioned in the Chinese media. Last week, Mr Ma (pictured) wrote that without the system, China's economy was "very likely to lose vitality and impetus". Wall Street shares are now flat, as financial stocks weighed down the index. On Sunday, US President Trump accused the Federal Reserve of hurting US economic growth by raising interest rates. The Dow Jones Industrial Average is down 39.5 points or 0.2% to 26,372.84. Top of the losers is Goldman Sachs, dropping 2.7% to $202.27 after reporting a 20% fall in profits due to tough trading conditions. The S&P 500 is now just 4.8 points or 0.2% lower to 2,902.22. Alliance Data Systems leads the losers, falling 9% to $164.60. On Sunday, it announced the sale of its marketing services business Epsilon to French advertising giant Publicis Groupe for $4.4bn. And finally, the tech-heavy Nasdaq is 31.3 points or 0.1% down to 26,381.05. The losers are led by Chinese ecommerce firm JDcom, which well 2.7% to $29.74. Last week, it was reported that the firm is making widespread job cuts.